Petronella Stone a history professor, was not in the least annoyed when her sister called in a favor – would Pet come and stay at her home to watch Parker, her brilliant 6 year old nephew? Actually, Pet would never give up time to spend with the adorable tyke and they had settled in admirably. For the last three thousand years big and handsome Santo Notte has fought in armies across the world and battled his own, more personal enemies. Of all the places he might expect to encounter his life mate, a quiet corner of upstate New York didn’t seem likely. But spotting Pet while hunting down a suspected rogue immortal, he knows that she will be the greatest adventure of his eternal life. Once Pet realizes what he is he expects her to be surprised, confused, even overwhelmed. What he doesn’t expect is that Pet has a secret history of her own. Their attraction and passion is mutual, but Pet is having second thoughts as to whether she even likes the gruff one-word responses she gets while trying to make conversation. Santo, just has never had to deal with a 20th century woman before and needs to learn real quick before he loses the one woman he’s waited for his entire life! Bottom line – I love Lynsay Sands writing and the Argeneau series is the bomb! Santo and Pet are a riot together, not to mention the interactions you get with Parker’s innocent observations! Love the kid! The fans of this series are going to love this latest entry. And may I say, it’s never too late to read any of this series as most are stand-alone and always bring recurring characters back and forth! Ethan Sullivan and Merit are preparing for the upcoming wedding when an infiltrator to Cadogan House attacks Merit. Initially, they suspect the attacker has mental health issues but later events show them that dark magic is at work in Chicago. Will the rise of a dark sorcerer destroy Chicago? 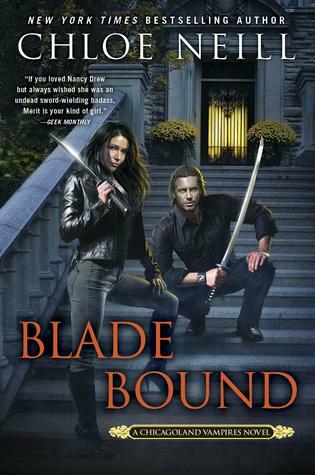 BLADE BOUND is the 13th and final book in the Chicagoland Vampires series and boy am I sad to see this series end! BLADE BOUND is best appreciated in the context of the series as a whole, particularly since it concludes several ongoing story threads (including the wedding). One of the things I love about Chloe Neill’s books is the action. Chloe Neill doesn’t waste any time kicking things into gear as the action heats up almost immediately. However, this doesn’t detract from the wedding, which goes about how you would expect a wedding between Ethan and Merit to go. Needless to say, they didn’t need a trash the dress party afterwards! And what can I say about the characters except that I love them? From the Ombuddies to the Cadogan House vampires to the Red Guards, each faction we’ve met throughout the series has earned a special place in my heart. Yes, Ethan and Merit are the heart and soul of the Chicagoland Vampires but all the supporting characters and factions are just as essential to Chloe Neill’s world. I love that BLADE BOUND truly showcases the diversity of the Chicagoland Vampires population and how working together is the only way to save the town from the sorcerer and her deadly weapon (and just wait till you meet her weapon!). Finishing BLOOD BOUND is bittersweet as I really am not reading to say goodbye to these characters or the Chicagoland Vampires series as a whole. Thankfully, Chloe Neill’s website indicates a spin-off series is in the works so hopefully we’ll get to see glimpses of Ethan and Merit in those books. Highly recommended! From the queen of shapeshifter romance, Terry Spear has opened up a new Billionaire Wolf series with book #1 BILLIONAIRE IN WOLF’S CLOTHING, and after reading this first book in a brand new series I am fully committed to continuing and pre-ordering the next books as soon as they become available. Rafe Denali is a self-made billionaire who got to this point in life thru sheer hard work and determination. He wasn’t a pushover and guarded his private life so that no one would discover what he truly was. Jade Ashton, hated that she was being forced by her evil brother to get close to Rafe to discover where his twin brother was. She had no choice as her son Toby had been taken from her and if she didn’t provide the information her brother promised to kill him. Frustrated to discover how difficult it was to attract Rafe’s attention, she walked into the ocean below his home and unfortunately got pulled away by a rip tide. Rafe had noticed her, and seeing how dangerous the rip tide was pulling her out to sea he immediately ran down to jump in the ocean in an attempt to rescue her. From there they both had the opportunity to realize that they had a very strong attraction to one another especially once Rafe discovered that she also was she-wolf. *** This story was terrific with immensely likable characters and a very fast pace that found me hard to put this book down for even a second! It was that good! The romance between Rafe and Jade was built slowly allowing time for Jade to grow so comfortable with Rafe and his gentle and generous nature that she finally came clean and told him why she was there and what she had been forced to do. First difficulty, find her son Toby and once that was accomplished the very precocious and adorable tyke had everyone wrapped around his chubby little fingers. Loved this child! Next locate her despicable brother and eliminate his threats. Bottom Line: I loved, loved this book. All the characters were fleshed out and the romance and sensuality between Rafe and Jade was quite tastefully done – just enough description but not over the top with blow by blow intimacy. Again – love BILLIONAIRE IN WOLF’S CLOTHING and cannot wait for the next volumes to this series.